Recent electricity price spikes and a state-wide blackout in South Australia have highlighted the need for reliable power to balance the potential volatility of some renewable power sources. Pumped storage hydropower projects are a natural fit in an energy market with high penetration of renewable energy as they help to maximise the use of the renewables that are subject to the vagaries of the weather. Pumped storage provides a load when the wind is blowing and the sun is shining, and it also provides a reliable and immediate source of energy when the sun has set and the wind has dropped. The recent completion of the feasibility study for Genex Power’s Kidston Pumped Storage Hydro Project in North Queensland shows this approach is now technically and commercially feasible. As the proportion of renewable energy in an energy market increases, the need grows for the stability and consistency provided by utility-scale energy storage. For example, South Australia needs system-wide storage of 500 MW for a period of 10 hours to improve the flexibility of wind farm operators, according to the Melbourne Energy Institute. At the smaller scale of energy storage, the buzz about various types of batteries continues – but the only storage option with a proven track record at the utility scale is pumped storage hydropower. Pumped storage hydropower works by pumping the water stored in a lower reservoir into a more elevated reservoir. The water stored at height can be passed through a turbine on its path back to the lower reservoir, creating electricity as and when needed, and making the best use of the water resource without waste. In a recent article, my colleague Donald Vaughan stated that a functioning AC power system needs inertia, fault level, frequency and voltage control as well as energy sources to function to an acceptable standard. Pumped-storage assets can provide all of these important contributions to a stable and successful power system, levelling out the fluctuations in availability of wind and solar energy, and helping to regulate voltage and frequency. Despite the significant potential and benefits of pumped storage hydro projects, only three projects currently exist in Australia (two in New South Wales and one in Queensland). These schemes were built in markets in which generation was mainly thermal, where the pumped storage could supplement supply at times of peak demand. A number of possible sites have been identified for new opportunities for pumped storage hydro, but so far very few have been developed beyond concept level. This means that opportunities exist for developers in states such as South Australia and Queensland that have set ambitious renewables targets and must maintain energy security. For successful pumped storage hydro projects, developers need to identify a viable site, achieve a technically and commercially feasible design, and make the most of the economics of the energy market. For a pumped storage project, what’s needed is a source of water, and two reservoirs separated by a significant change in elevation. The water could come from a nearby river, an existing reservoir, or the sea. With many thousands of potential sites across the country, a developer needs smart methods of filtering to reduce the many possibilities to just a few ideal sites. An important consideration is the effect on the viability of pumped storage projects of the relative remoteness of sites, through both the efficiency of the power’s round trip and the marginal loss factors (factors applied to a generator or a load, and calculated based on the size and distance of the generator or load from a central point). As for any development, the process of identifying sites must also consider topography, land use and environmental constraints. Pumped storage projects generally present similar but reduced environmental risks as conventional hydropower projects as they tend to have smaller footprints. Entura’s experience on Genex Power’s Kidston pumped storage hydro project has shown that it is possible to construct low-cost pumped storage projects in Australia through careful site identification and clever project design. Where a pair of suitable reservoirs don’t already exist, constructing a turkey’s nest dam may offer a solution. A turkey’s nest dam is a reservoir built by excavating earth from the centre of the reservoir and moving it to the edge to help form a continuous embankment. 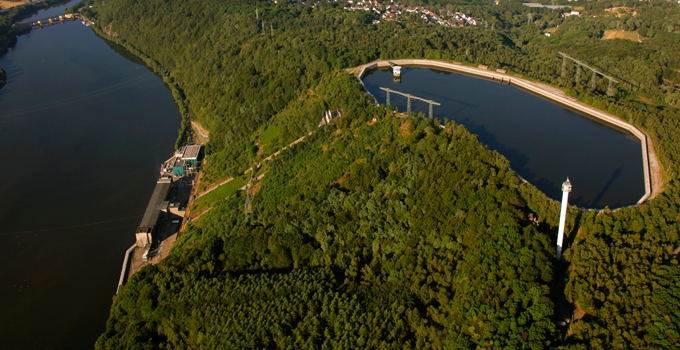 Turkey’s nest dams have been used successfully around the world in pumped storage hydropower projects, providing opportunities to build projects where elevation changes significantly over a short distance. Additionally, turkey’s nest dams can help to minimise capital costs by reducing conduit lengths and maximising head (the difference in elevation between the upper and lower reservoirs). Understanding the opportunities and constraints in the energy market is critical to a pumped storage project’s financial viability. When you can store energy, you can dispatch electricity at peak times, gaining the highest price point in the market. Conversely, water is pumped to the upper reservoir in off-peak periods or when supply from renewable sources is high and market prices are low. This ‘energy arbitrage’ makes the most of the price difference in the electricity market. Selecting the optimum installed capacity of a pumped storage project also requires detailed understanding of energy markets. 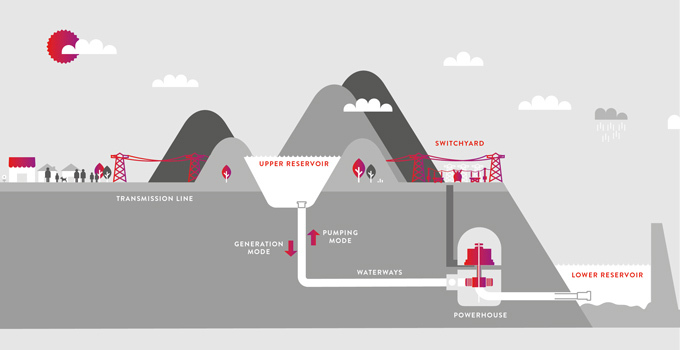 It is possible that a pumped storage project can act to flatten peak prices to the point where the returns on a project are insufficient to meet financiers’ hurdles, so detailed revenue modelling is essential to determine the tipping point between enough and too much installed capacity. With careful selection of sites, clever design, and the right mix of capacity and costs, pumped storage hydro holds an important key to unlocking the full potential of renewables in Australia’s electricity market. 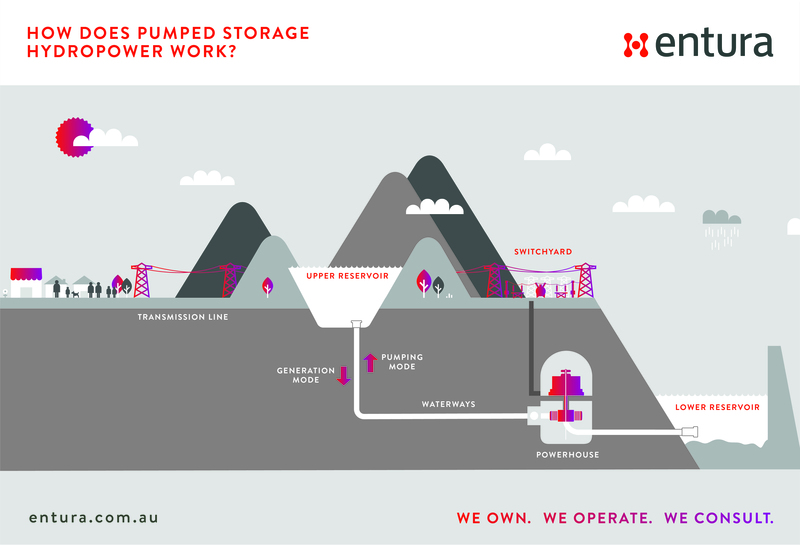 If you would like to discuss how Entura can help you explore potential opportunities for pumped storage hydropower projects, please contact Akhil Pai on +61 406 874 101, Nick West on +61 408 952 315, or Richard Herweynen on +61 3 6245 4130. Nick West is a civil engineer at Entura with 15 years’ experience, primarily in hydraulics and hydropower. Nick’s skills range from the technical analysis of the layout of hydropower projects to the preparation of contractual project documents and computational hydraulic modelling. Nick was a key team member of the Kidston Pumped Storage Project Technical Feasibility Study and was involved throughout the recently completed Neusberg Hydroelectric Project in South Africa. Nick has successfully completed projects ranging from hydraulic design for small residential developments to the feasibility study of a cascade of four large hydroelectric projects in Malaysia.